Cypress Moon features beautiful, cypress furniture that is handmade in Louisiana. We’re a family-owned & operated business that has been building wooden furniture for 23 years! Our famous Patio Swings are available in 7 different models: Classic Porch Swings, Rollback Porch Swings, Console Porch Swings, Decorative Porch Swings, Engraved Porch Swings, Swing Chairs and Swing Beds. Besides our wooden porch swings, we also sell Outdoor Gliders, Adirondack Chairs, Garden Benches, Rocking Chairs, Outdoor Chairs & Patio Sets. We take great pride in being an American owned & operated furniture company! CHRISTIAN SHIRTS - Besides operating Cypress Moon, we also own & operate the Clothing Company, Soul Harvest! Soul Harvest features all original Christian Clothing, as well as other Christian Products. Additionally, we've also added an ongoing collection of Christian Resources to help equip you as you Walk in the light of The Son! These Christian Teaching Tools include Witnessing Videos, Christian Sermons and links to other helpful Christian Websites. Our goals are to not only offer unique designs on quality products, but to also give the customer an opportunity to witness by wearing one of our shirts. While the Christian lifestyle involves many more facets than just your external appearance, a simple message on a shirt could possibly initiate a conversation between you and a lost brother or sister…and that is worth more than the cost of any shirt you could ever buy! 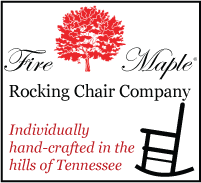 ROCKING CHAIRS - The Fire Maple Rocking Chair Company sells solid maple rocking chairs that are handmade in the rolling hills of Tennessee. Our original wooden rockers are constructed from pure Fire Maple and are available in over 65 unique color stains! Unlike most mass-produced rockers on the internet or in chain stores, our chairs are handmade from solid maple (not a composite of different types of wood) and are more dense in their overall structure. We take great pride in being an American Furniture Company and find it an honor to sell American made rocking chairs! SNUGGIE - Our newest venture is The Snuggie Shop - the official store for The Snuggie™ Blanket! Regular blankets are OK, but they can slip and slide, plus your hands are trapped inside. The Snuggie™ Blanket keeps you totally warm and gives you the freedom to use your hands. Work the remote, use your laptop or do some reading in total warmth and comfort! The Snuggie Shop carries many styles of the famous Snuggie Blankets, including Classic Snuggie, Designer Snuggie, Custom Snuggie, College Snuggie, Snuggie for Dogs, Snuggie for Kids, Sports Snuggie, and NFL Snuggie!